Dimitry Morozov, better known as vtol, is a Russian musician, engineer and artist who decided that selfies were far too modern for his liking. 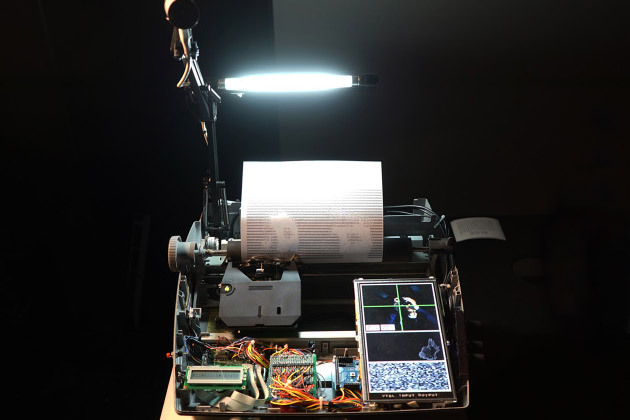 Instead, he wanted people to wait for their gratification, and so hooked up an iSight camera to an Arduino-controlled Brother sx-4000 typewriter. Once a person sticks their face in front of the machine, named i/o, the typewriter painstakingly hammers out a portrait in ASCII art. The hardware was shown off at the 101 festival in Smolny, St. Petersburg in Russia, which ended earlier this month - but you can still see the device in action if you watch the video. When people restore old typewriters, they mostly just make them (1) look new and (2) usable again. 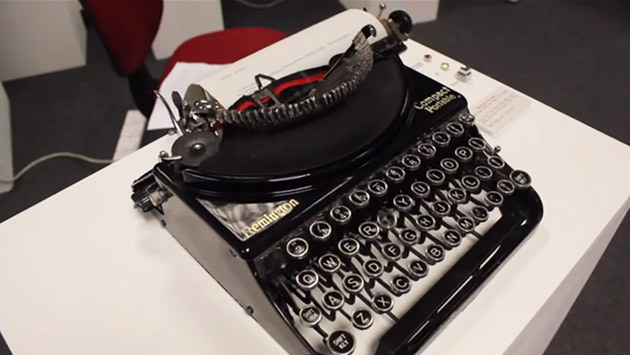 Joe Hounsham from Plymouth University in the UK, however, had other ideas in mind: he took one and added the appropriate upgrades to turn it a high-tech typewriter that connects to the internet. To be precise, Hounsham's device called Dico connects you to a random person from a chat room -- in fact, it starts looking for a stranger to talk to as soon as its ultrasonic sensor feels you approaching. The other person's messages are then processed by an Arduino microcontroller, which controls the solenoids the pulls down the keys on the typewriter. 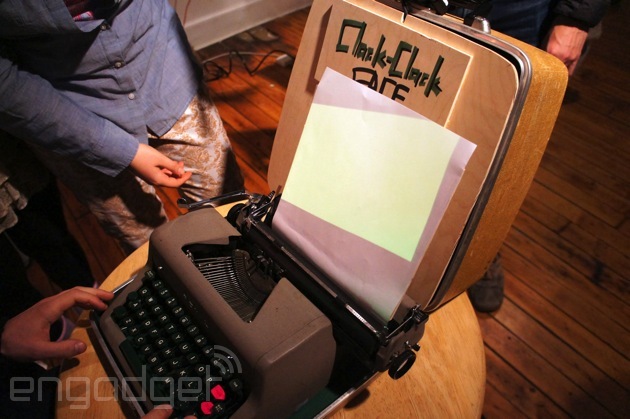 Yes, a paper serves as the device's "screen," and to reply, you need to type on it, as well. There's something oddly romantic about taking a piece of archaic technology and giving it new life as a work of 21st century art. Take the Royal Empress typewriter you see above. This particular model was built in 1961 and eventually landed in the hands of Amanda Gelb as graduation gift. She and her fellow classmates, Jinyi Fu and Quingyuan Chen, looked at the hunk of aging metal and saw potential instead of an obsolete writing tool. 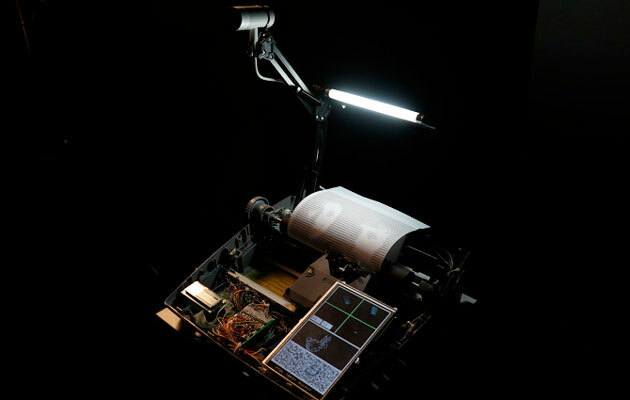 For their installation at the ITP Winter Show, they wired up each of the keys to an Arduino for tracking what a user types, then paired that with a tiny projector that displays the letters on a sheet of paper wrapped around the platen. The "face" part of the equation comes from the webcam mounted to the top of the typewriter case. It uses brightness to map a silhouette of the person sitting in front of it and fills only the darkened areas with letters, creating an ASCII portrait in real time. The code also automatically loops the letters you type, so even if you press only a single key the picture will appear. Of course, you could also type out a love letter or a quick blog post and the whole thing will be wrapped inside the confines of your outline. When you're done, you can press the re-labeled print key and a laser printer spits out your portrait.